TV REVIEW Doctor Who "The Waters Of Mars"
This review contains SPOILERS for "The Waters Of Mars". Adequately warned? Despite the Doctor stating that his mission on Mars is "fun", this emerges as one of the darkest episodes of New Who so far. Sure, there are amusing elements - the Bowie Base reference (Life On Mars, geddit?) and the, ahem, running gag about bikes. But this is an uncompromising, introspective story that leaves you pondering the nature of sacrifice, time and the Doctor's role in it. 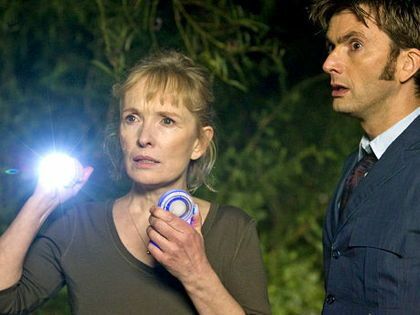 Set 50 years from now on Earth's first Mars outpost, "The Waters Of Mars" sees our lone hero stumbling upon colonists led by Lindsay Duncan's no-nonsense Adelaide Brooke. Learning the exact date, he recalls Earth history and apprehends that he's arrived at a fixed point in time. Sure enough, an underground Martian glacier releases its ancient Flood infection (water zombies, basically). Although terrifying in the way that all dehumanising body-snatchers are, it's not the drooling villains who provide the emotional kick. It's definitely a lump-in-throat moment as one victim re-watches the video of her family during her final moments, but it's the moral implications of the Doctor's actions which ultimately stun us into silence. In many ways, this doesn't unfold like a typical Doctor Who story. For starters, the Doctor does basically zilch until the last act. He's a passive observer, held there by his own curiosity but largely willing to let things play out without his participation. If he has an objective for the first half of the episode, it's seemingly to scram and save himself; in his exploration of the base, he feels more like Adelaide's companion than the other way around. When the Doctor does take action, it's confrontational, rebellious - a character not so much rescuing people for their own sake as angrily defying Time itself. His cry of, "The laws of Time are mine and they will obey me!" is temporarily uplifting but there's desperation about the "Time Lord Victorious" speech. In amongst all this grandeur and philosophy it's easy to overlook the details. "Waters Of Mars" feels neatly convincing and everything nods to iconic big-screen science fiction like 2001, Silent Running or maybe even The Thing. It hints at a wider universe, one in which the Spanish and the Philippines have credible space programmes and where the World State has overcome the "oil apocalypse". It also dovetails snugly with the new Whoniverse timeline, and Adelaide's memory of the Dalek attack is an unexpected but welcome flash of continuity. Perhaps not everybody will enjoy this episode quite as much as I did. Detractors could point at the underused robot GADGET (is it even technically a robot if somebody's manually controlling it? Yes, I am that pedantic), the occasionally intrusive music and the repetitive flashbacks to those internet pages. There's a lot of running along corridors. Some conservative viewers might question whether suicide is a suitable conclusion for a Sunday evening family show. But as a piece of storytelling it's gripping, the kind of no-easy-answers science fiction I'd like to see more of; it succeeds in keeping you guessing right up until the very end - indeed, there was even a moment when I was convinced Adelaide was going to use the gun to kill the Doctor. This is a courageous, taut story that could only happen at this stage in the Tenth Doctor's arc. The quality of the acting throughout, and all the supporting special effects, are of course first-rate. It ends with an appearance by Ood Sigma which ominously signposts the final instalments - the scene of the Doctor in the TARDIS is like a desperate man in denial about the terminal diagnosis he's been given. We now have to wait another six weeks to find out how his song ends. Sad though I'll be to see Tennant leave the role, if this is the sort of storytelling we can expect from his final performances then it's worth it. Feel free to either leave your thoughts on the episode and this review below, or click here to join our continuing discussion of what the hot "Waters Of Mars" topics are.